Servint Review 2019: Is Servint a Good Hosting? ServInt was founded in 1995 in the U.S. and since their inception has been the forerunner in providing the latest website hosting services to their customers. They pride themselves on their personalized service as well as their highly qualified staff. They already serve some big online names as seen from the list they proudly boast on their website. ServInt offers guaranteed RAM and CPU resources. What this means is that the servers not only support your requirements during normal usage but can also cope well with any spikes in operations during periods of heavy usage. The network is also redundant thanks to the use of diverse carriers, full BGP routing tables and divergent fiber paths. In order to make the packages more scalable and user-friendly, they employ the SimpleScale technology. This technology ensures you can upgrade quickly and seamlessly as the demands of your business increase. At the same time, you can carry out downgrades as well as hardware replacement without any trouble. They offer an SLA guarantee which will help you sleep better at night knowing your servers aren’t going to crash. Even though this does ensure accessibility and uptime, you can always revert to the backup thanks to the daily backups carried out by ServInt. Their Backup Retention and Disaster Recovery always keeps your data safe at the backend storage network. 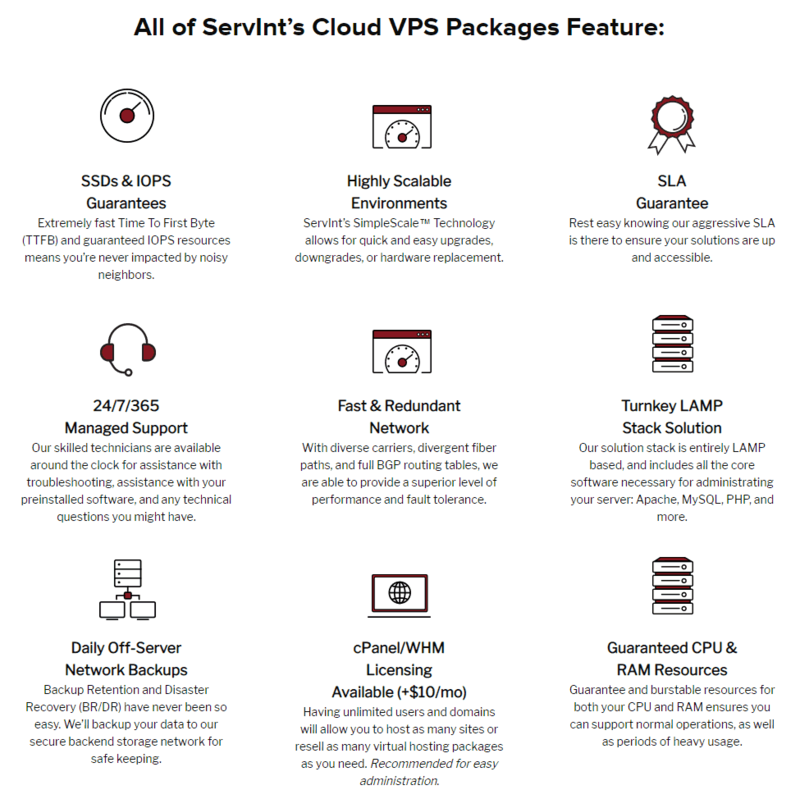 The cloud server services at ServInt are offered in four different packages. These include packages with 2.25, 4.50, 6,75 and 9.0 virtual cores respectively. The available RAM and cloud storage increases accordingly with each package. You also get 10TB bandwidth, 2 IP Addresses, and daily server backups as part of all the packages. ServInt is rather on the expensive side and is one reason for their decline in popularity. It is true that you may find similar packages at reduced prices elsewhere, but Servint’s experience in the field cannot be ignored. They can be reached by email, telephone or live chat. Their live sales chat is only offered during working hours on weekdays but the live chat is offered at all times. It must be noted, however, that you need to verify your identity before you are given access to the live chat. As a non-customer, you only have limited chat support. When I tried, I only had the option of emailing them my message. Their facebook and twitter pages are actively managed and are another way of getting in touch with them. With ServInt’s wide-ranging services of Cloud VPS, Flex VPS, and dedicated servers, you can rest assured that all the demands of your business are being met at all times. Thanks to easy scalability, you can upgrade anytime as your business demands grow. This is what makes them a great VPS and dedicated servers provider in my view. Wondering how Servint stacks up against other Web Hosting companies? Enter any other Web Hosting company and we will give you a side-by-side comparison.